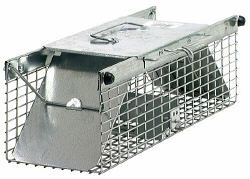 The Havahart 1025 trap is designed for catching Rats, Weasels, Chipmunks, Flying Squirrels & other similar size animals. This humane trap is designed for the needs of homeowners, gardeners, and business owners to capture and relocate pests without harming them. The interior has been designed to keep the animal safe; it has smooth interior edges to prevent animal injuries. Among the safety features this trap is designed with a solid door and a handle guard to protect the user while moving the animal. This double door trap gives target animals extra confidence to enter the trap. This trap can be set with both doors open or with only one door open. The trigger is located in the center of the 1025 trap and when the animal touches the trigger the doors close trapping the animal. Use bait in this trap to make it more appealing to the target animal. Open door dimensions 21 1/4 x 5 x 5"
Closed door dimensions 17 1/2 x 5 x 5"